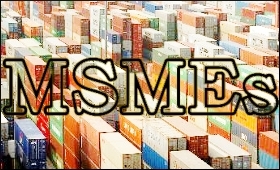 The contribution of Micro, Small and Medium Enterprises (MSMEs) in the exports of the country reached to 49.86 percent in 2015-16, the Commerce and Industry Minister Nirmala Sitharaman informed in a written reply in Rajya Sabha on Wednesday. According to Ministry of MSME based on DGCI&S data, the share of MSMEs in India's exports constantly showing shing of growth. In the year 2013-14 it was 42.42 percent; 44.76 percent in 2014-15 and reached 49.86 percent in 2015-16, said a release on Wednesday. The minister gave the credit to the various government's schemes. She said, the Merchandise Exports from India Scheme (MEIS) was introduced in the Foreign Trade Policy (FTP) 2015-20 w.e.f. 1st April, 2015 with the objective to offset infrastructural inefficiencies and associated costs involved in exporting goods/products which are produced /manufactured in India including products produced/manufactured by MSME Sector. Of the 11544 total tariff lines at 8 digit HS Codes, 7914 tariff lines are covered under MEIS scheme at present. The Scheme incentivizes exporters in terms of freely transferable Duty Credit Scrips which are transferable and can be used to pay certain Central duties/taxes. The Government also provides double weightage to exports of MSMEs for grant of one star export house status under the Status Holder Recognition Scheme of the Foreign Trade Policy 2015-20. Granted of Status Holder Certificate enables such enterprises to avail certain privileges under Foreign Trade Policy viz. Legal Undertaking in lieu of Bank Guarantee, facility for free of cost exports for export promotion etc. The Government has launched Interest Equalization Scheme on Pre and Post Shipment Rupee Export Credit w.e.f. 01.04.2015 for five years. The scheme is available to all exports of MSME and 416 tariff lines. The rate of interest equalisation is 3 percent per annum. This scheme is aimed at providing affordable credit to exporters to enable them to be more competitive in the global market. The Government introduced Special Advance Authorisation Scheme for export of articles of Apparel and Clothing Accessories w.e.f 1st September 2016 wherein exporters are entitled for an authorisation for fabrics including inter lining on pre-import, and All Industry Rate of Duty Drawback for non-fabric inputs on the exports. The Government has implemented the Niryat Bandhu Scheme with an objective to reach out to the new and potential exporters including exporters from Micro, Small & Medium Enterprises (MSMEs) and mentor them through orientation programmes, counselling sessions, individual facilitation, etc., on various aspects of foreign trade to enable them to get into international trade and boost exports from India. Under Export Promotion Capital Goods (EPCG) Scheme and Duty Exemption/Remission Schemes, Advance Authorisation (AA), Duty Free Import Authorisation (DFIA), Duty Drawback (DBK), Advance Procurement/ Replenishment of Precious Metals from Nominated Agencies, Replenishment Authorisation for Gems, Replenishment Authorisation for Consumables and Advance Authorisation for precious metals are also available for MSME products.